The disposable Wave Cup 4.7 oz is made in Italia from recyclable plastic. 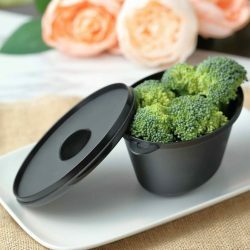 This disposable Wave Cup will send your customers to new culinary heights with these unusual and fascinating shape. The sloping edge will catch eyes and stoke interest in your dietary art. 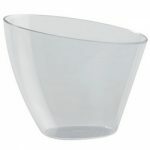 These verrine Wave Cup offer extra room for your desserts, soups, stews, and other delicious creations. The Wave Cup also makes a creative addition to your beautiful buffets or your Bakery. 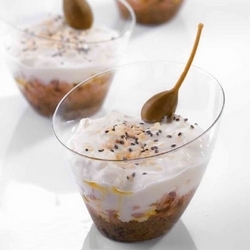 The disposable appetizer glassware is designed to be light and a unique combination of qualities which makes it the perfect way to enjoy any type of savory hors d’oeuvres whilst standing up, from casual snacks to more sophisticated entrées. The glasses are transparent to make food look even more appetizing and encourage chefs to experiment with new recipes. The disposable Vela Cup 6.7 oz is made in Italia from recyclable plastic. This disposable Wave Cup will send your customers to new culinary heights with these unusual and fascinating shape. The sloping edge will catch eyes and stoke interest in your dietary art. These verrine Wave Cup offer extra room for your desserts, soups, stews, and other delicious creations. The Wave Cup also makes a creative addition to your beautiful buffets or your Bakery. 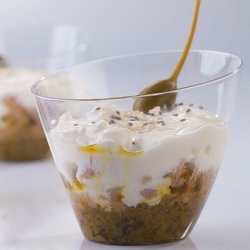 The disposable appetizer glassware is designed to be light and a unique combination of qualities which makes it the perfect way to enjoy any type of savory hors d’oeuvres whilst standing up, from casual snacks to more sophisticated entrées. 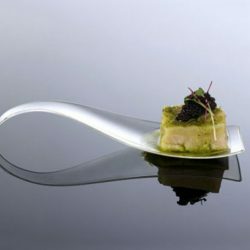 The glasses are transparent to make food look even more appetizing and encourage chefs to experiment with new recipes. The disposable Vela Cup 4.7 oz is made in Italia from recyclable plastic. This disposable Wave Cup will send your customers to new culinary heights with these unusual and fascinating shape. The sloping edge will catch eyes and stoke interest in your dietary art. 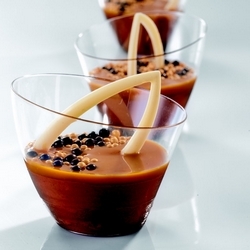 These verrine Wave Cup offer extra room for your desserts, soups, stews, and other delicious creations. The Wave Cup also makes a creative addition to your beautiful buffets or your Bakery. 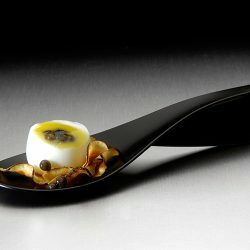 The disposable appetizer glassware is designed to be light and a unique combination of qualities which makes it the perfect way to enjoy any type of savory hors d’oeuvres whilst standing up, from casual snacks to more sophisticated entrées. 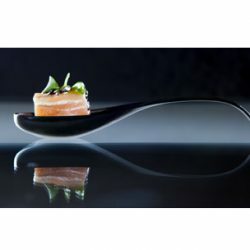 The glasses are transparent to make food look even more appetizing and encourage chefs to experiment with new recipes.